I found this book meme idea on the blog Bibliophile By the Sea. As the title suggests, the idea is to post the first paragraph of the first chapter of a book that I am currently reading. So this is my first First Paragraph - First Chapter - Tuesday Intro. 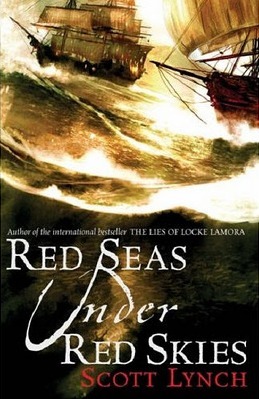 I am currently reading Red Seas Under Red Skies by Scott Lynch which is the second book in the Gentleman Bastards series. "Locke Lamora stood on the pier in Tal Verrar with the hot wind of a burning ship at his back and the cold bite of a loaded crossbow's bolt at his neck. He grinned and concentrated on holding his own crossbow level with the left eye of his opponent; they were close enough that they would catch most of one another's blood, should they both twitch their fingers at the same time."